Walt Disney World, Universal Orlando, and SeaWorld Florida have all put up signs about mosquito prevention efforts today. The Florida theme parks will also start offering free mosquito repellant to any visitors who ask for it. But curiously you won’t find the one word that matters on any of the signs or handouts: Zika. WDW News Today spotted the first mosquito prevention sign at Disney’s Animal Kingdom Park in Florida this morning. 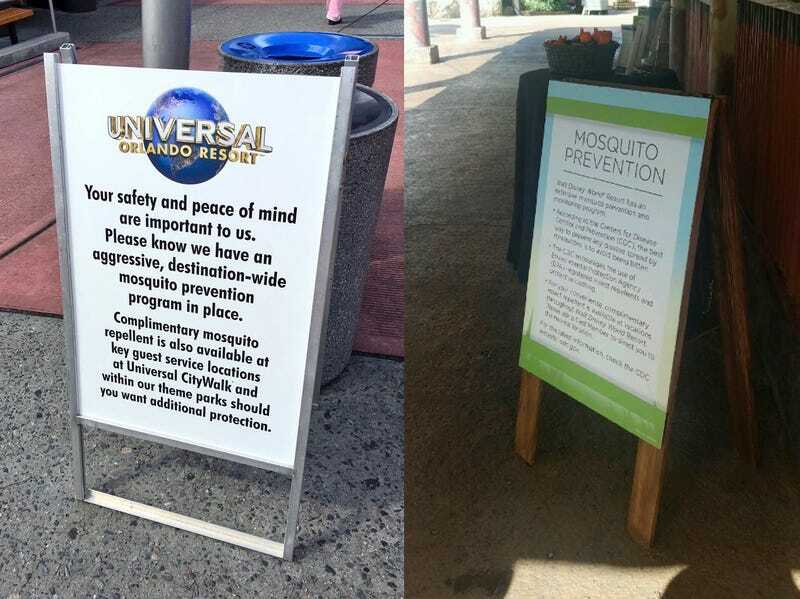 And theme park podcaster Derek Burgan spotted the new mosquito prevention signs at Universal Orlando. At this point just about everybody visiting Florida probably knows about Zika, the disease that’s currently making its way through Miami and can cause birth defects. But it’s still interesting that none of the materials at these parks mention the word. According to the Orlando Sentinel, Florida Governor Rick Scott has been talking to many of the Orlando area’s theme parks about what to do about the Zika situation. Tourism is obviously a huge part of Florida’s economy, and worries about Zika could potentially have a dramatic economic impact on the region. But the theme parks are still trying to avoid speaking plainly about what they’re facing. Even Disney’s statement about mosquito prevention doesn’t contain the word “Zika” once. Universal’s statement to CNN was identical in omitting any mention of Zika. And I get it. Disney especially doesn’t want to ruin the magic. You can’t buy a newspaper inside the Disney parks for just this reason. The outside world can’t intrude on the world of make-believe. But sometimes it has to. You can’t sprinkle pixie dust and make Zika go away. So perhaps, in the name of public health, just put the word Zika on the handouts and tell people what they’re dealing with. I promise that if they’re already in the park you’ve got their money. They’re only going to buy more gigantic plush Pooh bears to cut open and hide in like a Tauntaun to protect themselves from the Zika mosquitoes.